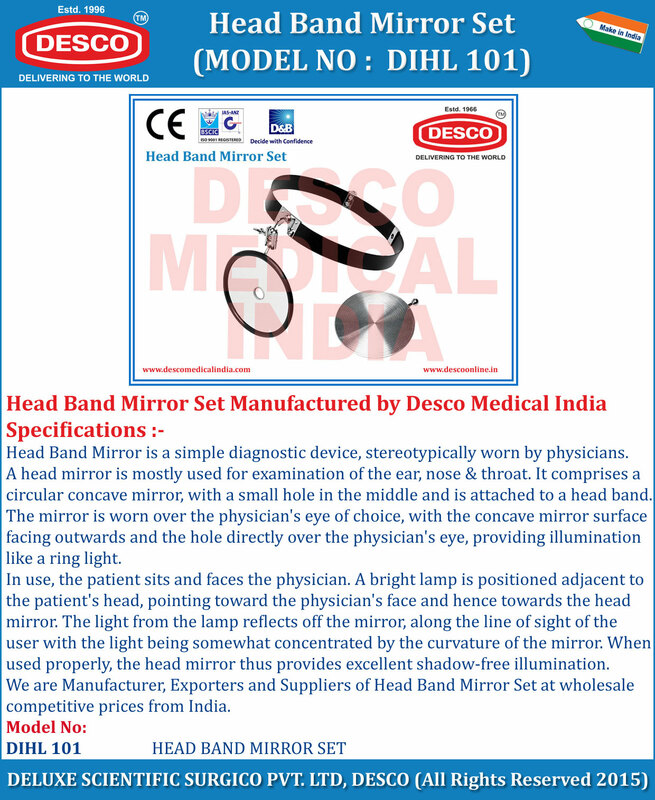 Head Band Mirror is a simple diagnostic device, stereotypically worn by physicians. A head mirror is mostly used for examination of the ear, nose & throat. It comprises a circular concave mirror, with a small hole in the middle and is attached to a head band. The mirror is worn over the physician's eye of choice, with the concave mirror surface facing outwards and the hole directly over the physician's eye, providing illumination like a ring light. In use, the patient sits and faces the physician. A bright lamp is positioned adjacent to the patient's head, pointing toward the physician's face and hence towards the head mirror. The light from the lamp reflects off the mirror, along the line of sight of the user with the light being somewhat concentrated by the curvature of the mirror. When used properly, the head mirror thus provides excellent shadow-free illumination. We are Manufacturer, Exporters and Suppliers of Head Band Mirror Set at wholesale competitive prices from India.